The effect of procalcitonin-guided use of antibiotics on treatment for suspected lower respiratory tract infection is unclear. In 14 U.S. hospitals with high adherence to quality measures for the treatment of pneumonia, we provided guidance for clinicians about national clinical practice recommendations for the treatment of lower respiratory tract infections and the interpretation of procalcitonin assays. We then randomly assigned patients who presented to the emergency department with a suspected lower respiratory tract infection and for whom the treating physician was uncertain whether antibiotic therapy was indicated to one of two groups: the procalcitonin group, in which the treating clinicians were provided with real-time initial (and serial, if the patient was hospitalized) procalcitonin assay results and an antibiotic use guideline with graded recommendations based on four tiers of procalcitonin levels, or the usual-care group. 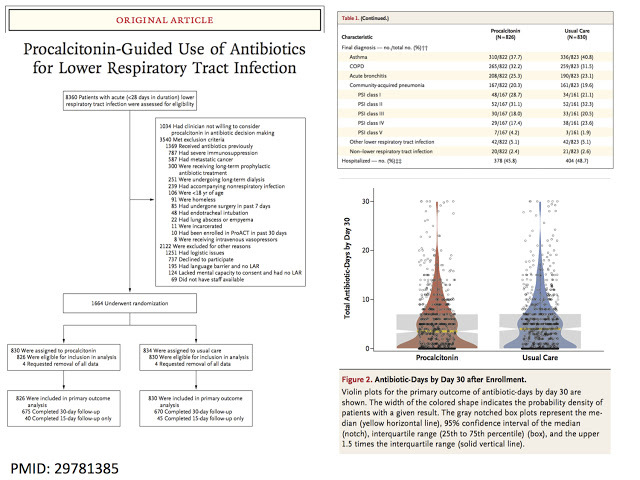 We hypothesized that within 30 days after enrollment the total antibiotic-days would be lower — and the percentage of patients with adverse outcomes would not be more than 4.5 percentage points higher — in the procalcitonin group than in the usual-care group. A total of 1656 patients were included in the final analysis cohort (826 randomly assigned to the procalcitonin group and 830 to the usual-care group), of whom 782 (47.2%) were hospitalized and 984 (59.4%) received antibiotics within 30 days. The treating clinician received procalcitonin assay results for 792 of 826 patients (95.9%) in the procalcitonin group (median time from sample collection to assay result, 77 minutes) and for 18 of 830 patients (2.2%) in the usual-care group. In both groups, the procalcitonin-level tier was associated with the decision to prescribe antibiotics in the emergency department. There was no significant difference between the procalcitonin group and the usual-care group in antibiotic-days (mean, 4.2 and 4.3 days, respectively; difference, −0.05 day; 95% confidence interval [CI], −0.6 to 0.5; P=0.87) or the proportion of patients with adverse outcomes (11.7% [96 patients] and 13.1% [109 patients]; difference, −1.5 percentage points; 95% CI, −4.6 to 1.7; P<0.001 for noninferiority) within 30 days.